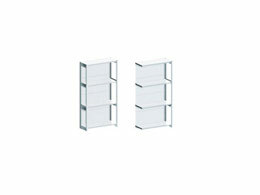 What is the purpose of the Standard Galvanised Shelving? With easy assembly and spacious shelves, the Standard Galvanised Shelving system can give you the needed space to organize and store any items. From paint and tools to cleaning supplies and household items, this unit will give you easy access to the items you need the most. 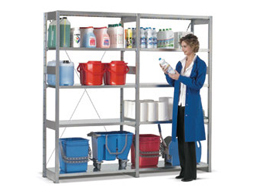 Use Standard Galvanised Shelving for buckets, spray bottles, bulk cleaning supplies, painting supplies, and much more. It can also be used for items to restock shelves at retail stores, restaurants and cafes. The Standard Galvanised Shelving is made out of sturdy and tough material with a galvanised finish for a rugged and strong look. Don’t waste precious space with unorganized storage – use this shelving system to make your life and business efficient. The Standard Galvanised Shelving is great for use in garages and basements of corporate office buildings and even homes. Retail stores can easily store unused items in a back storage room with the help of this shelving system. 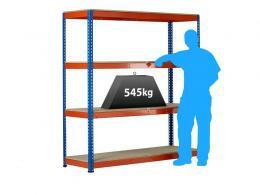 Any inside environment is suitable for the Standard Galvanised Shelving, which can accommodate light- to medium-weight supplies and items. Retailers and suppliers can use this product to store extra materials and supplies needed to keep their businesses running efficiently. 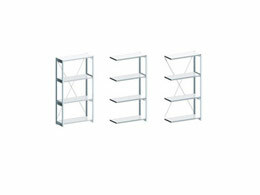 Even though the shelving unit is made with a tough, galvanised finish, it can be used by individuals in the home. Use the Standard Galvanised Shelving to store your bulk cleaning supplies, household items, boxes of old keepsakes, arts and crafts, and much more.